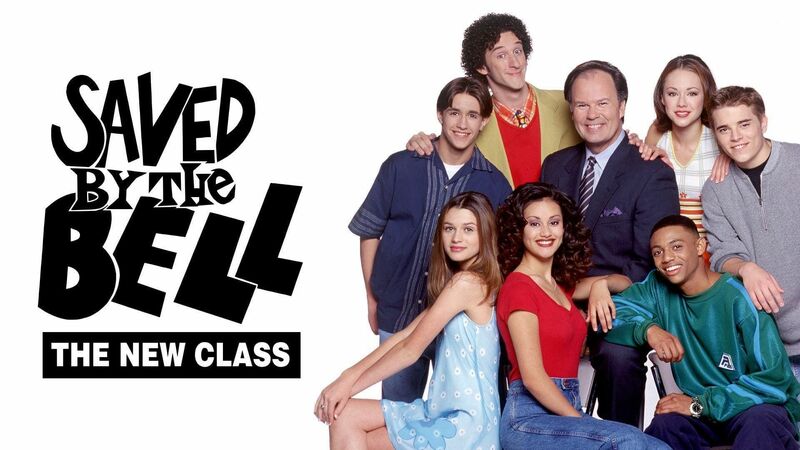 Here's where to watch every episode of Saved by the Bell: The New Class season 3. Mouseover or tap an episode to see where to stream it. Click or tap the play icon to stream it on the best available service. Welcome to Bayside Sep 9, 1995 New transfers to Bayside include three students from arch-rival Valley High: R.J. ""Hollywood"" Collins, head cheerleader Maria Lopez and Ryan Parker, who stole Bayside's mascot the year before. The old gang greatly resents these newcomers. Ryan makes plans to date Lindsay, make Maria the head cheerleader and get R.J. to emcee the Welcome Back dance. The two groups fight so much that Mr. Belding makes them stay on separate sides of the gym at the dance and wear identifying badges. But before the night ends, the enemies all dance with each other. Also, Tommy D. is thinking of how to get back together with his old girlfriend, Lindsay. The Love Bugs Sep 9, 1995 Maria and the others are trying to win tickets to the Grungefest from the radio station, but Lindsay wins them on her first try! Tommy has told Lindsay that he wants to get back together with her, so she must choose between him and Ryan. The girls hold a slumber party to help Lindsay decide. Tommy borrows some high-tech communication equipment that Screech has bought for the school and he plans to bug Lindsay's room. Ryan has the same idea, though, and he gets R.J. to help. Eventually all the boys end up hiding in Lindsay's closet or under her bed. A few more misunderstandings occur until Lindsay finally decides to go to the show with Maria. Driving School Sep 16, 1995 Maria is getting a car for her 16th birthday, but she's failing Driver's Education. She pleads with Screech to pass her, and he agrees against his better judgment. Meanwhile Ryan needs a car to compete with Tommy for Lindsay. He gets the idea of pooling money to buy one and he recruits Rachel, R.J. and various nerds, jocks and band members to join in with him. When he's still $600 short, he gets a rich kid named Arthur to go in on the deal by using Rachel as bait. Rachel can't stand Arthur and gets mad at the boys for using her.Later, Maria is out driving with her friends when she hits Mr. Belding's parked car. Ryan and the gang use their money to buy an identical car while Mr. B's is being fixed. But the other partners show up and demand to have their turn in the new car. When Mr. Belding shows up and sees all the students piled into what he thinks is his car, he demands to know what's going on. Maria and Screech both own up to their mistakes. What's the Problem Sep 16, 1995 Lindsay is nominated for Homecoming Queen, and so is Maria, even though she really doesn't want it, but she soon becomes competitive. Mr. B asks Rachel to help tutor star football player Todd Green to keep him eligible. She finds that Todd can grasp things she tells him very well, but he has great difficulty reading. An attraction develops between Todd and Rachel.Meanwhile, the Homecoming Queen campaign has gotten heated with Ryan and Tommy working for Lindsay and R.J. becoming Maria's manager. The campaign gets dirty when Maria is accused of being a Valley High ""traitor."" Todd fails to complete the test he's been studying for. Rachel tells Mr. B. about Todd's problems. The principal suspects Todd might have a form of dyslexia. Todd is mad at Rachel at first but things get straightened out and Todd passes a verbal makeup test. Lindsay and Maria stop the dirty campaigning and vow that whoever wins will give the crown to the other girl. Who wins? Rachel, as a write-in! Air Screech Sep 30, 1995 The gang are all working at Palisades Mall; even Screech and Belding are working at Mr. B. 's brother's sporting goods store. Tommy gets an expensive watch as a gift for Lindsay. Ryan can't afford that kind of competition. R.J. mistakenly spray-paints some athletic shoes at the sporting goods store, but surprisingly, customers like them and want to buy more. Ryan sees the opportunity to make money and soon he has the gang working on making more ""Air Screech"" sneakers to sell. Ryan makes his move on Lindsay. When Mr. Belding finds out about the ""Air Screech"" fraud, he finds a way to teach Ryan and the others a lesson. Tommy goes out with Lindsay while Ryan is stuck at the mall in a chicken costume! Big Screech on Campus Sep 30, 1995 Screech takes the gang on a tour of his alma mater, Cal U., where it seems his old fraternity brothers aren't very interested in him, but are interested in the girls. One of the guys, Michael, make plays for both Maria and Rachel. Tommy, Lindsay and Ryan sit in on a psych class and get hypnotized, which results in Lindsay and Ryan being attracted to R.J. and Rachel, respectively, while Tommy goes for...Mr. B!Screech is down about being forgotten by his old buddies, so Ryan concocts a plan to make him popular by pretending that R.J. is a star football recruit. The guys buy this and try to get R.J. to join their fraternity. When R.J. tells them his hero is Screech, they plan to make Screech fraternity president. Screech is so impressed he wants to quit his Bayside job and return to Cal U. But everything is revealed at a phony ceremony for Screech, including Michael's two-timing of Maria and Rachel. Boundaries Oct 14, 1995 Rachel goes on a date with a college boy but feels guilty when she becomes the victim of abuse. Ryan's Worst Nightmare Oct 21, 1995 The dreaded teacher ""Wicked Witch"" Hurst is giving one last killer physics test before leaving the school. Tommy breaks a date with Lindsay to study, so Ryan jumps in and takes her out instead. Later he spends half the night talking to her on the phone. The result is that Ryan has done no studying of his own, so he convinces Screech that it's ""National Fire Drill Day"" in order to get out of taking the test. The sprinkler system goes off and all the Homecoming floats in the gym are ruined. A new teacher, Mrs. Rumplemeyer, takes over the class, and she's even tougher than Miss Hearst. It turns out to be Mr. Belding in drag, trying to teach Ryan a lesson. Ryan works to repair the damaged floats and when Lindsay asks him out, he declines--he has to study. Fear of Falling Oct 28, 1995 The girls' gymnastic team, featuring star performer Lindsay, should be going to the state finals, but they don't have the money and the coach has quit. Ryan's schemes to pump up attendance and generate money include letting it ""slip"" on R.J.'s radio show that Michael Jordan will attend the girls' next meet! (Mr. B. make him refund the money.) In practice, Lindsay sprains her ankle. When it comes to rehabilitation, she's afraid to put herself through a full workout. Lindsay tells Ryan that she doesn't want to take any risks and she won't compete in the finals. Tommy leads the football players on strike in support of the girls' team. Screech talks to Lindsay and he tries to straighten her out.At the semi-final meet, the stands are full. Maria and Rachel both get excellent scores for their routines, then just in the nick of time, Lindsay arrives in uniform. She scores a ""10"" in her event. Bayside wins the meet and will go to the state finals. The Principal's Principles Nov 4, 1995 Belding and Tommy switch places. Tommy is the student principal but when he lets everyone goof off, he realizes that being a principal is a serious job. Screech's Millions Nov 4, 1995 Screech thinks he's won the lottery. My Best Friends Nov 11, 1995 Rachel feels left out when Lindsay and Maria spend time without her. Screech's Dream Nov 18, 1995 Screech feels that he's not important until he has a dream about the future that shows how important he is at Bayside. R.J.'s Handicap Nov 18, 1995 The gang goes on a class field trip on a cruise. R.J. learns a lesson in respect when he falls for a disabled girl. Casino ID's Nov 25, 1995 During a semester-at-sea, the gang attempt to get into the ship's casino to gamble. The Fallout Dec 2, 1995 Lindsay and Ryan break up after Lindsay finds another guy. Ryan can't take he and Lindsay not being together anymore and he tries to make her jealous by giving her old necklace to Sonya. The Christmas Gift Dec 9, 1995 Tommy helps out a homeless girl who's working at the ski lodge. New Year's Resolution Dec 9, 1995 The gang all help Screech come up with a New Year's resolution by sharing their own resolutions.